On Showroom Saturdays at the Riggs Distributing and Showroom our chefs prepare different recipes each week to highlight the features and benefits of Sub-Zero and wolf appliances. In addition to providing a “taste drive” of our products, our chefs often create new recipes that become favorites at home as well. For the upcoming Thanksgiving holiday, our chefs prepared a variation on the classic turkey main using only the large breast meat and rolling them with a sourdough bread, portobello mushroom, and bacon stuffing to make a roulade. This recipe is idea for both smaller groups as well as those trying to be health conscious at the holiday dinner table. For those who prefer to cook an entire bird, have your butcher separate the pieces and roast (or confit them for an indulgent addition) them separately roast. 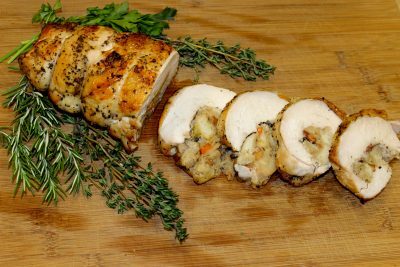 Additionally, coat the rolled and tied breast with your own fresh herb combination for an extra punch of holiday flavor. 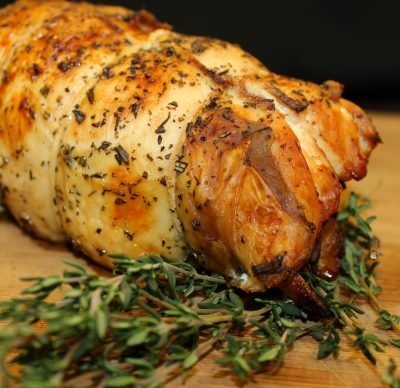 Get the recipe for: Turkey Roulades with Sourdough, Portobello, and Bacon Stuffing. Come visit the Riggs Showroom on Saturdays and catch our chefs’ demos at approximately 1:30pm. Request an individual appointment for dedicated time with one of our Showroom Consultants.